Have you ever stood in front of your painting, trying to mix the perfect colour, with absolutely no idea how to do it? Frustrated that your mixes just don’t work, muddy browns or vivid greens and your paintings look wrong. Or have you been struggling to understand colour mixing for years, sometimes getting it spot on but other times when it goes wrong, have no idea why or how to fix it? On this simple colour mixing course you’ll discover how to mix 80% of the colours you actually need using just 4 colours – in 20% of the time. Over 4 hours of tuition you’ll gain an understanding of the properties of paint, how colour works in paintings and learn the foundations of colour theory. I demonstrate using a traditional, 3 primary & 3 secondary colour wheel to teach you a step-by-step approach so you can achieve perfect colour mixes and harmony in your paintings again and again. Working through these progressive tutorials, you’ll be guided by your new colour mixing intuitions, opening up the fantastic world of colour. Please note: Filmed in 2012, this course is due for a technology makeover to come in line with our more recent courses. The teaching and principles are exactly the same as in the other courses, so you’ll get fantastic results. Enjoy this half-price offer and treat yourself to a new paint tube! Understanding how colour works in painting gives you the knowledge to start mixing the perfect colour yourself in a weekend, regardless of your current level of skill. If you don’t understand colour, you’ll probably keep making the same mistakes for years to come! I want to teach you a clear step-by-step approach that will give you the greatest results in the shortest amount of time, using the best techniques I have developed over 20 years of painting so you don’t make all the mistakes I did. When I was studying classical painting in Florence, I would often come across students that were so keen to emulate the classical techniques, they seemed stuck in a time warp. One student I met, let’s call him Leonardo, was in his third year visiting a specialist art atelier summer school. Each week of study was costing him over $1,500. His drawing was great, but he was scared stiff by colour. Convincing himself that he would be ‘ready soon’ he kept on putting off using paint. I asked if he was going to try painting a portrait the next day and he recoiled in shock. Tomorrow? No, I might be ready next year…to move on to charcoal! I too love comprehensive classical education. But that’s not what Simple Colour Mixing method is. It’s a way of getting you painting and feeling confident with simple colour mixing in your paintings. We’re just going to take it one step at a time, so let’s start at the beginning with learning the language of colour. 3 x acrylic paintings taking you step-by-step from drawing, right through to the final brushstrokes. Over 4 hours of detailed step-by-step video instruction so that you can follow along at your own pace. Judging the three elements of colour, understanding this allows you to evaluate any pigment in minutes. Putting theory into practice by mixing and matching a colour accurately in the studio, using the colour wheel as a guide. Discovering how different colours can interact to create harmonious colour mixes. Learning about the colour bias of pigments and complementary colours gives a greater understanding of the different properties of paint. Reading a paint tube, then comparing multiple pigments side by side, uncovering individual intensity and bias. Making your own colour wheel and why you don’t necessarily need all the pigments. 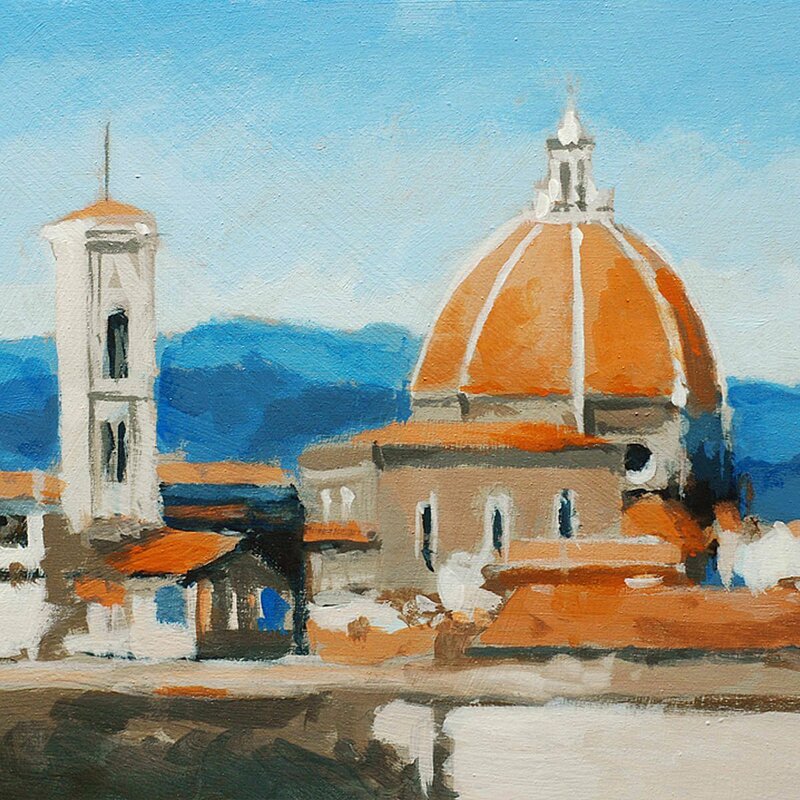 A warm and cool complete study of the Duomo in Florence, learning how to add saturation or mute down mixes using blue and orange as our palette. 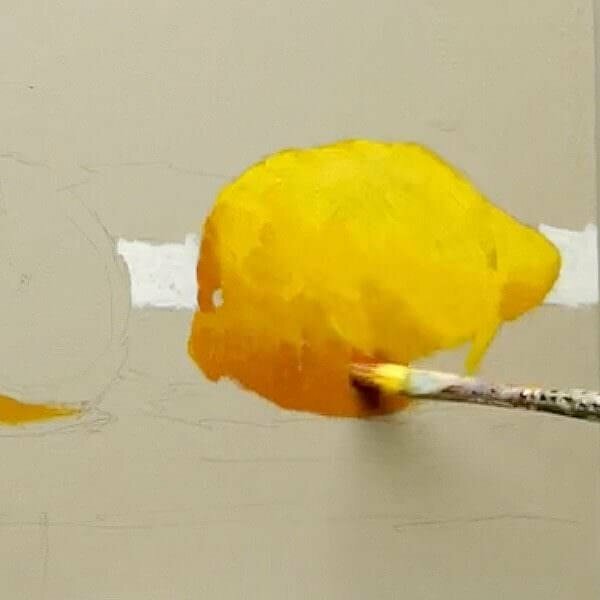 Adding colour into the shadows guided by the colour wheel to create a tonal range just using two colours, yellow and purple for a lemon study. Discovering how powerful colour perception can be. Should you use black in your mixes? Some surprising advice on using black to create subdued shades. Looking at traditional and modern pigments. How to choose the right palette for the style of paintings you’re trying to create and how to select paints in the art store. Putting all our knowledge into practice for a more challenging final study that looks at an extended range of colours. Mixing and matching a more complex still life composition. A 7,000 word PDF guide – which includes all the reference images used throughout the course, alongside JPEG reference images and your materials list. The video files are large (1GB) so you need a broadband internet connection and enough space on your computer hard drive. A broadband internet connection – the files sizes for the video lessons are quite large (1 GB in total) so can take a while to initially download (depending on your internet speed.) Once downloaded, they are yours to keep forever, watch without buffering or take to the garden and watch away from an internet connection! I really enjoyed the course and could see improvements as I progressed. 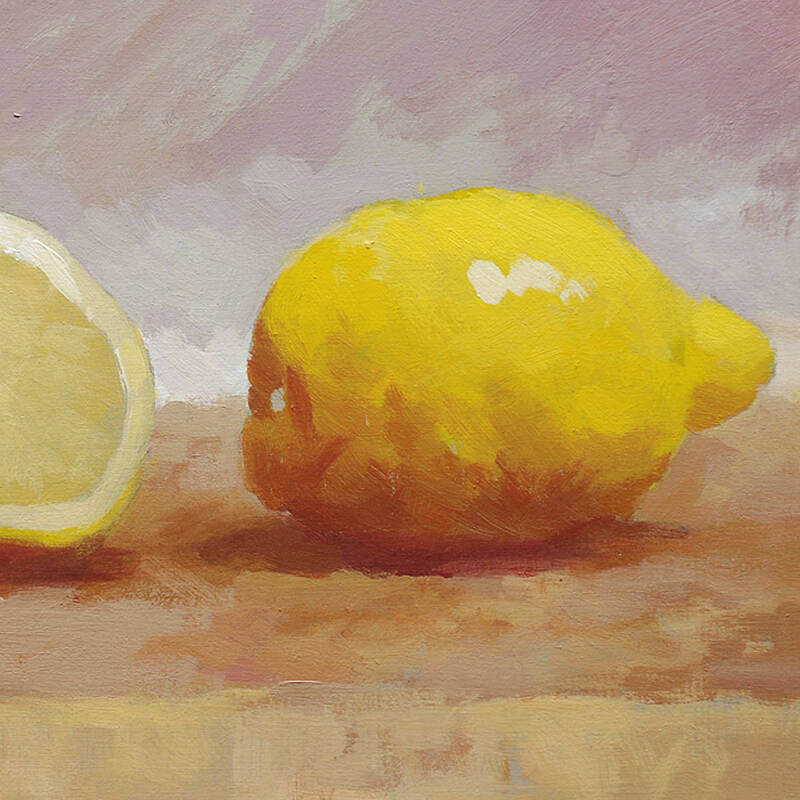 With the lemons I didn’t like my first painting, so I did it again and tried to make it have a lighter feel to it. Thank you for the wonderful course. I feel I could go through some of it again as there was so much information to absorb. It was certainly excellent value for money. Best wishes and thank you for a fabulous course. I have recommended your courses to my art teacher here and to other people also. It was so many years ago I tried to paint but now I decided to start again. I really enjoyed this course and will continue with the Impressionistic Seascape. After not understanding the use of colour for too many years, I now look at paintings with more understanding and am confident to start and use colour. I particularly enjoyed your brief analysis of paintings. Many thanks for starting me off and helping develop my use of colour. Although the demonstrations are in acrylics, the course has been designed so you could transfer the skills and knowledge to oils. 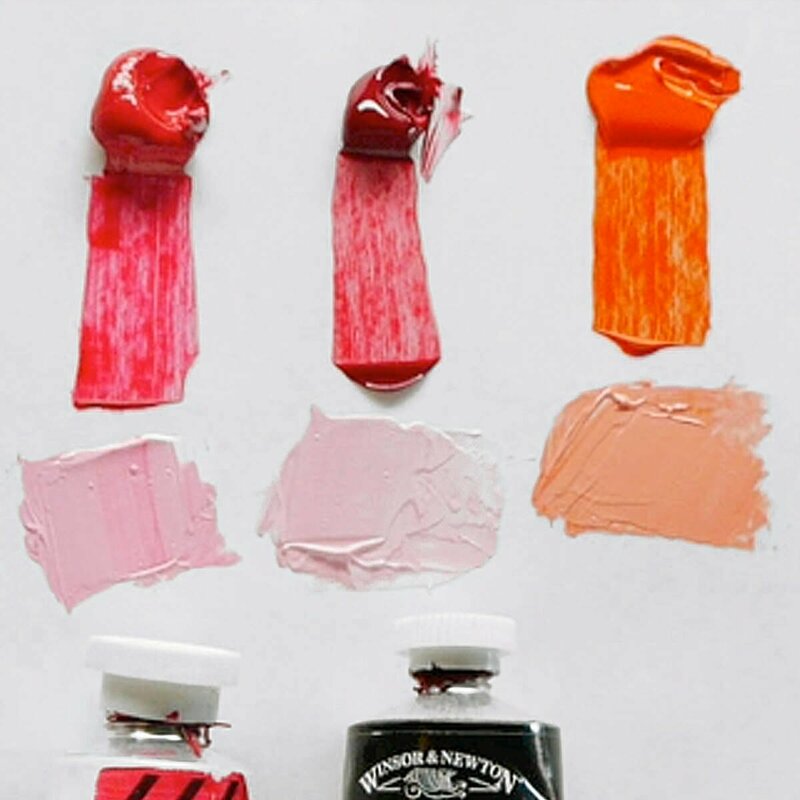 The smart palette I use is available in acrylic and oils. 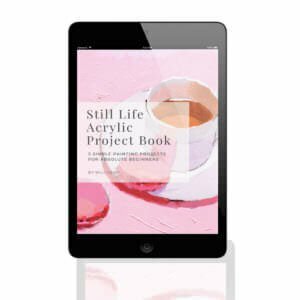 No, this course takes a minimalist approach to transform a beginner or someone who feels lost with colour, to being a painter who is confident with colour mixing and colour choices. There are other colour wheels and other colour mixing systems you may come across, such as Munsell, Quiller wheel or the Yurmby wheel. Many realist painters and designers relying on print use the Munsell colour notation system for more technical, advanced and exact descriptions of colour. However, I don’t demonstrate them on this course, I believe the traditional approach is the easiest and most straightforward for a beginner to gain a full understanding of colour mixing and work like an artist rather than a technician when finding your confidence with colour. Why? Because you would have learned the foundations of colour theory and understand how simple it is to mix and match the perfect colour, every time. If you follow the lessons in progression then by the end of the course you will have three finished paintings, a city scene of Florence, and lemon still lemon and colour mixing exercises. Each completed with three different styles of colour palette. You’ll have gained a foundational knowledge of how to mix acrylics.